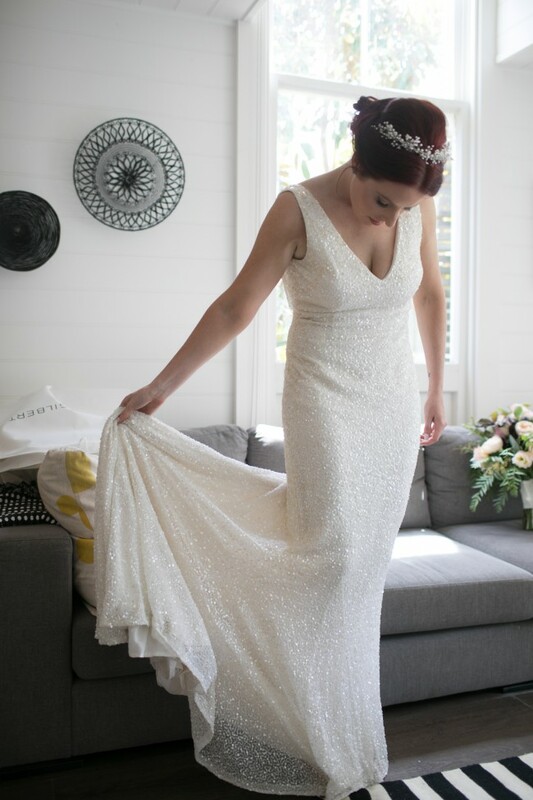 Stunning Rachel Gilbert "Giselle" Dress in ivory. Timeless and elegant. This dress would fit AU 8-10. In excellent condition and professionally dry cleaned by hand at Syndal's Bridal Dry Cleaners (see certificate). Purchased at Rachel Gilbert Armadale boutique for $3000. Hand-embellished sequinned tulle, lined with silk-satin. Featuring classic V-neck at the front with good coverage and an elegant low cowl back with lace detailing. Back of the dress has a short train (not too long, still comfortable to wear). Side invisible zip closure. I had a seamstress add a wrist loop on the underside of the skirt lining. On size tag listed as AU 2 / UK 10/ US 6/ FR 38/ IT 42. I am approx. 170cm tall and usually a size 8-10. This dress fitted beautifully, with the front sitting at ground level when I wore a medium heel. It's lined with bra cups. As I am a DD bra size, I wore a stick-on bra for extra support that was easily hidden by the dress. Photos shown are not to be re-used by other parties. Once you send a message, Cherie can invite you to purchase the dress.